We know many drivers enjoy the wide panorama scenes through the ultraview power sunroof. The wide window offers a view for both front and rear seat occupants. The steering wheel has tilt and telescoping features that lift it out of the way for easy driver side entry and exit. The interior cabin has fold-down seats that provide custom-sized cargo space. At Lithia Auto Stores, we can answer any questions and demonstrate the interior features of the 2018 Cadillac XT5. We invite you to take the wheel and enjoy a test drive. 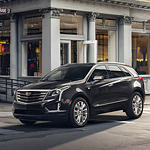 You can experience the luxury and comfort of the XT5 first-hand. Please call for an appointment or drop by today.